South Asian Histories for All celebrates big wins! 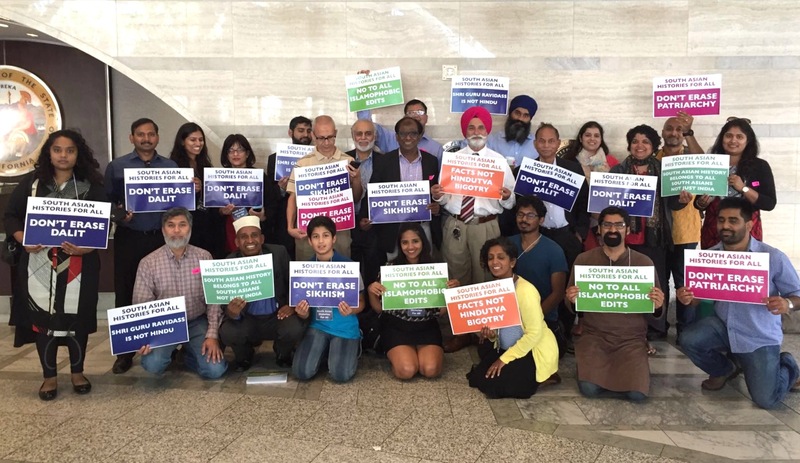 SACRAMENTO, JULY 14, 2016 — South Asian Histories for All (SAHFA), a multi-faith and inter-caste coalition of 8 religions and 25 organizations across California and the U.S., celebrated significant improvements to California’s new history and social science textbook curriculum, despite significant opposition from Hindutva (Hindu fundamentalist) groups. On July 14 2016, as the Board of Education met to approve the framework, powerful testimonies by nearly 100 SAHFA members asked the Board to revise inaccurate and ideologically driven statements on caste and Islam, and to use South Asia as a geographical term to describe “ancient India” where appropriate. Muslim groups also pointed out that Islamophobia fuels racist attacks against Sikhs, Hindus, Dalits, and other communities. Hindu speakers from SAHFA agreed, describing how Hindu Americans have been victimized by anti-Muslim bias. Muslim community groups appreciated that the Board corrected three of the five major errors. For example, the board decided to remove text inaccurately depicting Islam as an inherently war-mongering religion. Muslim Americans remain disappointed that the two remaining major factual errors were not addressed. 2. CASTE: An inter-caste coalition pushed back at outrageous statements in the text, inserted by the Hindutva (Hindu nationalist/fundamentalist) lobby, asserting that caste promoted “social stability,” and that many Hindus in the US and in India “no longer identify as belonging to a caste”. Speakers quoted the 2014 Indian Human Development Survey, which found that 1 in 4 Indians are willing to admit that they actively practise “untouchability,” or caste-based discrimination. Sadly, caste-based organizations, marriages, and ceremonies continue to be practiced by many communities in the United States. SAHFA also asked the State Board of Education to review the travesty of democratic public process that occurred at the two previous curriculum hearings. At those hearings, only the list of suggested edits from the Uberoi Foundation (the funder of the Hindu American Foundation and other Hindutva groups) was used as a starting point for discussion, while lists of suggested edits from opposing viewpoints were completely ignored. SAHFA members described this as a significant bias within an otherwise open and transparent public process. 3. ANCIENT INDIA: For the first time in this process, the Board heard from SAHFA members with origins in Pakistan and Bangladesh, asking for a more inclusive term like South Asia to be used where appropriate. The Board rejected this suggestion, stating that the standards on which the curriculum was based, used the term “ancient India”. In retaining the term “ancient India”, the text now defines at the start that “ancient India” is shorthand for the full list of nations in modern South Asia. 5. OTHER VICTORIES: SAHFA members also appreciated the Board’s decision to include significant improvements in several other areas of the curriculum, including ethnic studies, Korean comfort women, Filipino-American, and LGBT histories. These decisions advance the more plural and diverse approach to history that SAHFA has been working for. 6. NEXT STEPS: The final text of California’s new history and social science curriculum will be published shortly. Textbooks based on these guidelines will be developed over the next year. SAHFA will participate in the process of reviewing the new textbooks, and work to ensure that teachers have multiple fact-based and nuanced educational materials that will support their classroom experience. The SAHFA coalition commends the public process that ensured that a diversity of voices and opinions were heard throughout the creation of the curriculum, and looks forward to a similarly rich process in the future. We hope that this curriculum helps California students learn about diverse and complex world cultures and histories, with openness and respect. South Asian Histories For All (SAHFA) is a diverse coalition of teachers, students, parents, and community members, including Buddhists, Christians, Dalits, Hindus, Jains, Muslims, Sikhs, Ravidassias, and atheists. Comprising 25 organizations, the group has also submitted its own set of recommendations in support of the South Asia Faculty, Dalit Bahujan Faculty, and Muslim Studies Faculty Group edits.